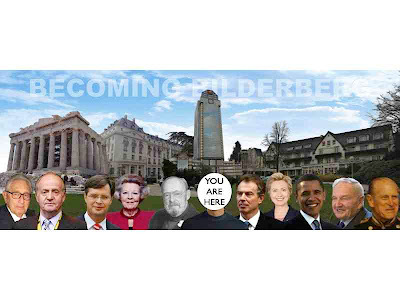 Thanks to Charlie Skelton for bringing the Bilderberg's 2009 meeting in Greece into the mainstream media. His reporting begins with a bit of skepticism and ends with eyes wide open. He is organizing an awareness campaign for 2010. Nice one, Charlie! First, we have just launched a new company called filmzrus that makes short films for companies and nice people. We want people to know more about us. We are a niche production company that creates short film content for your website, blog, or other promotional or branding use. Second, the real Bilderberg meeting is happening right now! What a great time to ask the question..."What if anyone could become part of the Bilderberg group?" In 2007, a Dutch newscast prompted me to research the group. I became interested in Bilderbergers because it began in Holland, sponsored by the father of the current queen, but no one really seems to know who they are! 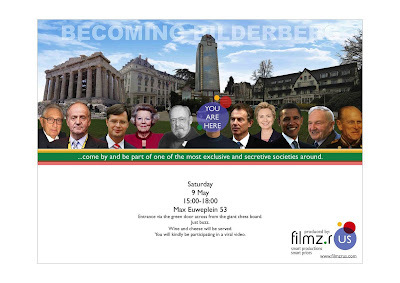 The Becoming Bilderberg video shoot is happening this Saturday, the 9th of May, from 15:00 to 18:00 at Max Euweplein 53. Please come and bring your friends! one version 2 from Tom van Klingeren on Vimeo. ONE is a new product and advertising solution that is interactive. Products (anything from DVDs to digital cameras to perfumes!) are placed on the ONE shelves. When customers reach for specific products, the audio and video come alive with information on the product you have just selected. Smart! Background (L to R): Athens, Greece meeting 2009 (location not yet known), Trianon Palace Hotel in Versailles, France meeting location 2003, Ritz-Carlton Hotel in Istanbul, Turkey meeting location 2007 (same year as Dutch news broadcast about Bilderberg), and Bilderberg Hotel in Oosterbeek, Netherlands meeting location 1954 (founding Bilderberg meeting hosted by Prince Bernhard). Foreground (L to R): Henry Kissenger, King Juan Carlos of Spain, Jan Peter Balkenende, Queen Beatrix of the Netherlands, Prince Bernhard of the Netherlands, Tony Blair, Hillary Clinton, Barak Obama, David Rockefellar, and Prince Philip, Duke of Edinburgh. 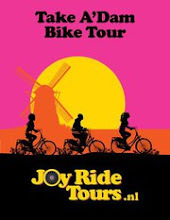 A cultural travel show for kids filmed in India, The Philippines, Australia, New Zealand and The Netherlands.